Can Bernie Sanders Win Back Iowa’s Working Class? If he can’t, Donald Trump’s brand of right-wing populism looms large. Newton, Iowa—According to my GPS, One Dependability Square doesn’t exist. Yet here it is: huge, sleek, with alternating stripes of beige stone and wraparound windows, and completely deserted. The old brick factory buildings around back still say Maytag in white letters one story high. You might say it’s the loneliest place in town. For over a century, Maytag washers and dryers spread the gospel of high-quality American manufacturing across the globe. At its peak, the Newton plant employed 4,000 workers—in a town of 16,000. But after the North American Free Trade Agreement, the company started moving production to Mexico. In 2006, Maytag was bought by Whirlpool, which shut down the plant the following year, laying off a workforce that had shrunk to 1,700. The headquarters has remained empty ever since. Nancy Brown’s husband worked at Maytag for 34 years. His union contract stipulated that he would receive health insurance for the rest of his life as a retirement benefit. But Whirlpool eliminated his coverage. Stories like that bring the candidates to Newton. Bernie Sanders drew some 350 supporters to the high school in September. Hillary Clinton, who has a paid organizer here, came in July. Yet The New York Times’s account of her house party, which described the town as a “farming community,” only mentioned Maytag as the name of a local blue cheese. Herman Cupples worked at the plant alongside his father and mother-in-law. “My son was on a Maytag scholarship. All that’s gone,” he says. Cupples says he’s tired of politicians and their promises. “We vote for people. They go up there to Washington. And they do nothing.” That’s why, Cupples told me, he’s voting for Donald Trump. The audience is mostly over 50, with a sprinkling of young people. They’re with him—up to a point. They’ve seen his Golden Double Stuf commercial, so his pledge “I’ll never eat another Oreo”—a staple of Trump’s stump speeches since the summer, when Nabisco announced it was laying off half its Chicago workforce and shifting production to Mexico—gets a big laugh. But when he’s not clowning or boasting, Trump seems unable to connect. “I love Iowans,” he tells a roomful of cheering supporters. “They love our country.” This gets applause, too, though when he follows with “They love money,” the room goes silent. Pledges to “take back” American jobs from China and Mexico rouse the crowd once more, but the cheering stops when he says, “Maybe we can get Maytag back.” Not even Trump can sell that fairy tale. I didn’t come to Iowa to see Donald Trump. I came to report on the Democratic presidential debate in November, and to try to get a sense of what happened to the Iowa that for 30 years had sent Tom Harkin, a progressive icon, to the Senate, but which now has two Republican senators, three Republican congressmen (out of four seats), and a Republican governor, Terry Branstad, who is racing to turn his state’s Medicaid program over to private companies by the end of this year. Iowa isn’t the only blue state to turn red. For decades, as Thomas Frank laid bare in What’s the Matter With Kansas?, the Republican Party has successfully lured away working-class voters by mobilizing “explosive social issues…which it then marries to pro-business economic policies.” Last month, Alec MacGillis added a new wrinkle, arguing in The New York Times that “many people who in fact most use and need social benefits are simply not voting” at all. For 30 years now, working-class voters have been told they were on the wrong side of history—that globalization was the wave of the future, information and innovation the source of all wealth. Manufacturing was passé. Then, the “rising American electorate” of 2008 apparently obviated the need for class politics. Only it turns out women, people of color, and young voters aren’t any happier working longer hours for less pay than aging white men. If keeping disaffected Democrats at home is a recipe for a Republican victory—as happened in Iowa in 2014—what would it take to bring them back? It was Hillary Clinton’s husband, after all, who deregulated the banks and turned welfare over to the states. Hillary herself has been sounding a more populist note lately, vowing to “make our economy work…for every American,” while invoking “factory workers and food servers [and] nurses who work the night shift.” But her Wall Street ties continue to haunt her. And in Iowa, where Concentrated Animal Feeding Operations litter the landscape and Big Ag calls the shots, her long-standing friendship with the Tyson family (whose company recently lost a class-action lawsuit to workers at its Storm Lake plant) probably doesn’t help. Martin O’Malley also sounds like a progressive firebrand now. Back in 2007, though, he sang a different tune, urging Democrats to hug the center line and collecting money from Wells Fargo and Visa when he headed the Democratic Governors Association in 2012. Bernie Sanders might promise to break up the big banks, tax Wall Street speculators, and raise the minimum wage, but he is increasingly viewed as unelectable. Saying so has become a badge of respectability among the mainstream press, even—or should I say especially—among those who claim to share his values. This was never going to be a fair fight. When Sanders tells audiences “We have got to transform the Democratic party,” they cheer. But do they understand what he means? To win—not just Iowa, but the nomination—Sanders will have to do more than draw big crowds and raise tens of millions of dollars (though he’ll have to do that, too). His supporters will have to do more than light up Twitter and Facebook and put up cool websites. They’ll have to fight state parties packed with office holders who—no matter how decent their politics—owe their places to the current system. They’ll have to train organizers, and mobilize voters, and overwhelm the party machinery—starting here in Iowa. How much chance is there of that? Optimism of the will is part of Becker’s job description—and he’s good at it. This is, after all, a man who worked as a political consultant in Cairo during the Arab Spring and, when he was arrested by the Egyptian government, refused a chance to flee the country, preferring to stay and fight the charges. At the Central Iowa Democrats Fall Barbecue up in Ames, they already know the rules. These are party regulars—the polite Midwestern version of yellow-dog Democrats—and when Bill Clinton tells them, “I’ve watched all these debates, and I think I’m going to vote for Hillary,” he has them in the palm of his hand. This crowd cares about offices, not ideology. So long as Clinton looks invincible, no one is going to complain that her declaration “There is no middle ground in going after these terrorists” is a not-so-veiled criticism of President Obama. Or ask how her claim “I was the only one on the stage last night who would commit to raising your wages, not your taxes” squares with her refusal to back a $15 minimum wage. And why should they? Clinton’s insistence on settling for $12 hasn’t stopped the Service Employees International Union—the union behind the Fight for $15—from endorsing her. As have the American Federation of State, County and Municipal Employees—the government employees’ union—and both of the big teachers’ unions. The Sanders people will tell you that national endorsements, like national polls, don’t register much in Iowa. “Caucuses are very public,” Becker explains. “If you’re in the same caucus with the president of your local, it can be difficult to defy your boss. Otherwise, it doesn’t really mean anything. We feel strongly rank-and-file folks are going to come through for us.” It’s a good argument, weakened only by the fact that we both knew Sanders had worked hard to get the backing of National Nurses United—and was still chasing other union endorsements. Driving around Iowa City later in the week, I see dozens of Sanders lawn signs, only a couple for Clinton. “I put a lot of those up,” says Jeff Cox, a Texan who teaches history at the University of Iowa. A former Democratic county chairman, Cox is a veteran activist who says Sanders should expect no quarter from the party organization. “We’ve been fighting a losing battle, nationally and locally, against the neoliberal takeover of the Democratic Party,” he says. Iowa has 1,682 precincts, and on February 1, 2016, Democrats will gather in each one. The process takes hours, and identifying those voters prepared to put in the time makes the caucuses a brutal, but arguably efficient, test of a candidate’s ground game. Iowa was a disaster for Hillary Clinton in 2008. Paralyzed by staff infighting and the candidate’s indecision, a campaign that was all about inevitability ran out of money and momentum, giving Obama the victory that propelled him to the White House. Clinton, who had been leading in the polls for months, finished third. That won’t happen again. Iowa City, a college town frequently caricatured as “the People’s Republic of Johnson County,” should be Sanders country. Yet on a cold Tuesday night, I see a dozen volunteers working the phones at the local Clinton headquarters. None of them are taking anything for granted. Sanders doesn’t have to win Iowa. He does need to do well, though—and a loss here for Clinton could shatter her claims to electability beyond repair. I’d seen Clinton’s strength among women and Democratic loyalists, and Sanders appealing to college students and what, for lack of a better label, I thought of as Nation readers. But I kept thinking about the sign I’d seen at the Indian tailor’s shop at Merle Hay Mall in Des Moines: Cash Only. Or the old man bussing tables at the food court there, trying to plug the gap between his Social Security and what he needs to live on. Or Malik, a tall young man with a diamond in each earlobe, who tells me he’s for Trump. “He’ll bring more jobs. 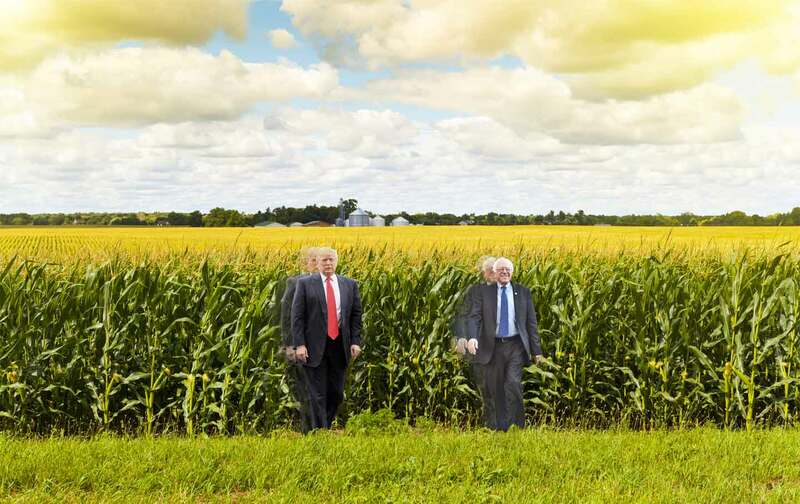 My main thing is jobs.” If Sanders is going to break through in Iowa, he needs to reach outside his base, to Iowans desperate enough to consider voting for Trump. So I headed down to Ottumwa, a wounded blue-collar town surrounded by factory farms. The Morrell packinghouse here started production in 1877 and had over 3,000 workers into the 1970s. After Morrell shut down, Hormel built a plant. But as Steve Siegel, a county supervisor, tells me, “Hormel played one plant off against another.” Thirty years ago, during the P-9 strike in Minnesota, workers in Ottumwa walked out in sympathy—and then were fired. “This had always been a union town,” Siegel says. “The neon sign outside the UAW here still says ‘CIO’”—a relic from the 1930s. But bad blood persists between the fired picketers and those who went back to work, he adds. When Hormel closed, Cargill came in and built a slaughterhouse capable of processing more than 18,000 hogs a day. With each change of ownership, workers lost pay—and the pace on the killing floor speeded up. “About 15 years ago, they started actively recruiting immigrant workers,” says Siegel. Language barriers made it harder for the union to organize. Earlier this year, Cargill sold out to JBS—the world’s largest meat processor—whose head office in São Paulo is over 5,000 miles from Iowa. “We have Bosnians, French people, Latinos, Filipinos, Somalis, Ethiopians,” says Jim Telfer, head of the United Food and Commercial Workers Local 230. He hands me a stack of aging contract books. “When I worked for Hormel in ’85–’86, we made $12.54 an hour. When Cargill came in, we went back to $5.80.” The starting wage now, says Telfer, is $14.70—less than $7 in 1985 terms. Picket signs are the first thing I see in Chris Eby’s office—piled against the wall, ready for action. “Bernie Sanders was speaking at Coe College here in September,” says Eby, president of Local 100G of the Bakery, Confectionery, Tobacco Workers and Grain Millers Union in Cedar Rapids. Eby’s employer, Penford Products, a local corn processor, had just been sold to Ingredion, a $6.9 billion conglomerate. “Our members made $24 an hour—good jobs with good insurance,” Eby says. “Our contract expired in August, and their last best offer demanded over 120 concessions—everything from reducing vacation days and pay to freezing pensions. They also wanted to impose a new insurance plan with a limit of $5,000 for out-of-pocket expenses. That could put you in bankruptcy,” he adds. With 95 percent of the membership voting against the company’s offer, the workers are still without a contract. Ingredion hired LB&F, a company that provides replacement workers. “They brought in sleeping trailers. It’s all to send a message of intimidation,” Eby says. When Sanders walked an “informational picket” before his speech, it was the first time the Iowa press covered the dispute. Does that mean he sees no differences between Sanders and Clinton? Not at all. “We’re willing to settle for $15 an hour, not for $12. If people are going to work hard, they need to get a living wage.” He also likes Sanders’s opposition to the Bakken pipeline, which would take fracked oil from the Dakotas through Iowa to Illinois. Though it’s opposed by farmers and environmentalists across the state, and by the Meskwaki Nation, “traditional labor loves the pipeline,” Espy notes. So far, Clinton hasn’t taken a position. Coincidentally, the Plumbers and Pipefitters Union—among the most vocal in support of the project—gave $1.5 million to Clinton’s Priorities USA super-PAC. “You don’t have to be a rocket scientist to follow the money,” Espy says. What would it take to keep such people engaged? At the very least, a sense that this is really their fight. That there’s more at stake—for them—than seats on the Supreme Court, or the balance of power in the Senate. That they might actually regain some control over their own lives. Which really would require a political revolution.